They had us at ‘perfect’! A perfect or best-ever anything is intriguing especially when it’s a recipe, and it’s sampled at the International Food Bloggers Conference (IFBC), where food writers are eager to compare and analyze food. Since I recently shared my favorite Travel Snack Bars, I was doubly interested in this Perfect Snack Bar by California Almonds. 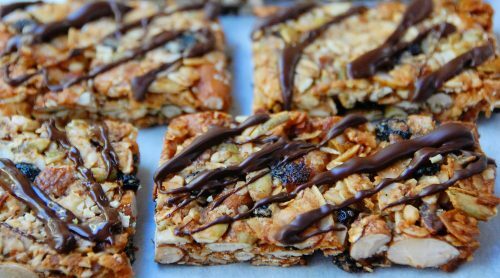 Packed with almonds and almond butter, pumpkin seeds, coconut, currants, honey, and drizzled with chocolate– it was pretty perfect and looked pretty too. Crunchy, nutty, not-too-sweet. Betcha can’t eat just one! But give me a recipe and I almost can’t stop myself from tweaking or substituting. How many times is there one ingredient missing from my pantry, no matter how carefully I check? This time it was almond flour. So in keeping with the gluten-free theme of the recipe, I substituted coconut flour which was in my freezer and seemed right with the coconut chips in the recipe. I’ll always remember an interview I heard with a Bon Appetit Magazine editor who said something like, “Our recipes are a guide for your creativity and flavor preference. We just want you to enjoy cooking and eating”. That’s how Rita and I feel too! In that spirit, here are a couple more revisions: I substituted maple syrup for some of the honey, because I like maple; I baked the bars – the original is unbaked – to make them crunchy vs soft-chewy. I think the bar is quite perfect baked or unbaked. And how does this one compare to my snack bars? Both are darned excellent. Make the one you have the ingredients for! Note: I was not compensated by IFBC or California Almonds, but was provided a discount to attend the conference reviewed here. For more information about IFBC check these Facebook posts and info about IFBC 2017. Come join us! Heat oven to 350°F.Spread whole almonds on a baking sheet. 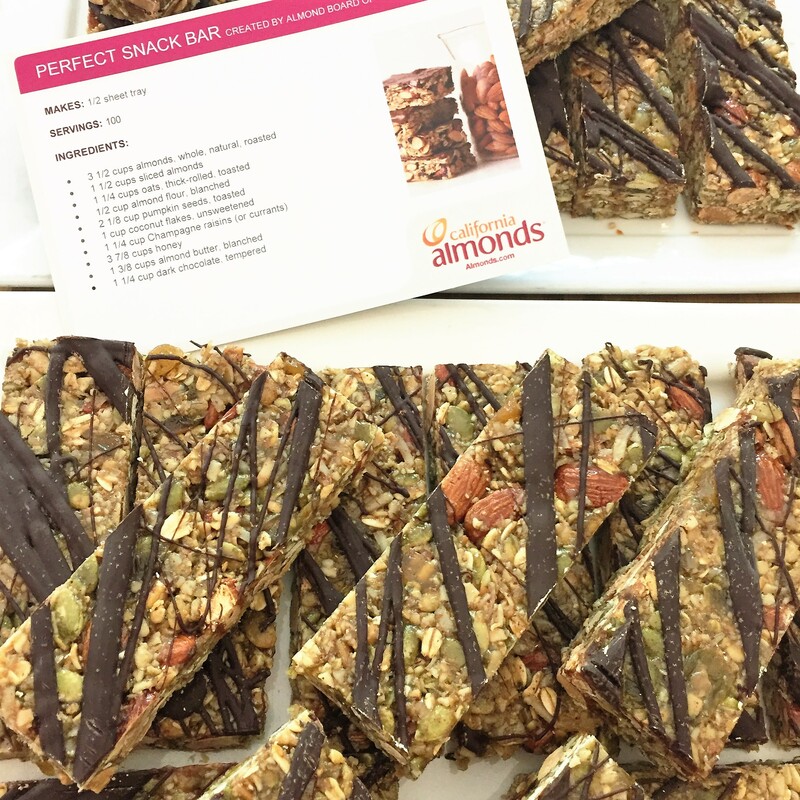 Spread pumpkin seeds, sliced almonds and oats on another baking sheet. Bake each for 10-15 minutes, or until toasted, stirring once or twice. Cool. Transfer to a large bowl; add currants and flour. In a medium saucepan over medium heat, bring honey (and maple syrup if using) to a simmer. Heat to 240°F. This should take about 5 minutes, maybe less, and should be at a full simmer. OR, microwave in a 2-cup pyrex 3-4 minutes (it will bubble up), stirring every minute. If you don’t have a thermometer, check by drizzling a tiny bit in a small bowl of ice water. It should form a soft ball between your fingers. **see note. Stir almond butter into the honey then immediately pour over the ingredients in the bowl. Stir quickly and thoroughly until mixture is evenly coated. Press onto a parchment or foil lined baking sheet to a thin layer. It should nearly cover a 13×18-inch pan. 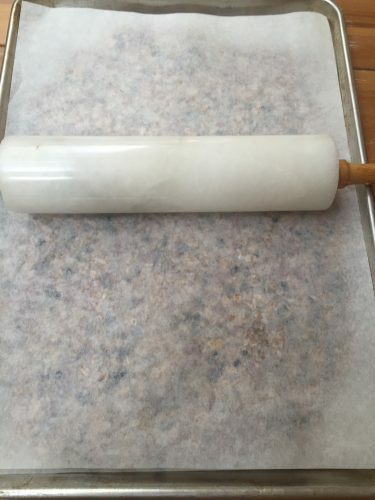 I place a second sheet of parchment over and press/roll with a rolling pin to flatten. For soft-chewy bars, cool completely then cut. Drizzle with melted chocolate if desired. For crisper bars, bake at 325°F for 15 minutes or until edges start to brown. Remove from oven. Cut into bars with a sharp knife. The center bars will be less crisp. Cool completely on pan. For very crispy bars let stand 15 minutes after cutting, then with a spatula divide bars between two baking sheets so there is space between them. Bake at 325°F additional 8-10 minutes or until golden brown. Look for unsweetened coconut chips in the bulk foods section at stores like Whole Foods or Sprouts. I buy raw pumpkin seeds at Trader Joe’s. **Be very careful heating the honey or maple syrup, it burns quickly. Use a candy thermometer but be sure it’s a working thermometer. I used an antique thermometer gifted to me by a dear friend, but sadly the mercury stopped rising (nothing to do with the planet Mercury in retrograde which is now!). Within seconds as I watched the simmer, the honey and maple scorched BLACK– quite a stench and sad waste. I’ll need to say goodbye to that relic and properly dispose it. thanks for sharing… I am heading to Farm Tank in Sacramento. anyone going? Hi Betsy! Thanks for being a tester. I’ve found the recipe quite flexible – I accidentally left the almond butter out of a batch and they still were great. It’s all those crunchy almonds and the honey — yum! These look right up my alley! Printing out the recipe!!! I think you’ll find it irresistible! It’s those toasty almonds and honey! These sound fantastic and I love the idea of using some maple syrup in place of part of the honey. 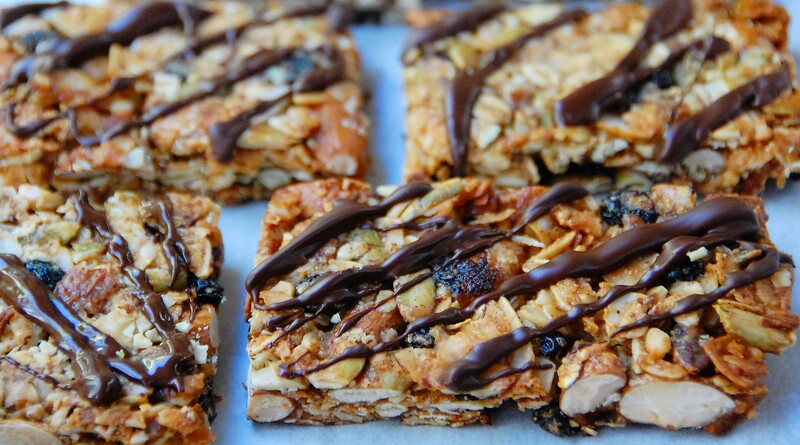 I’ve been wanting to make some snack bars and these are now first on my list to try once I stock up on almonds again. Hi Nicole! I like to stock up on Almonds from Trader Joe’s or Costco – they always seem fresh. I’d love to hear how the recipe works for you. 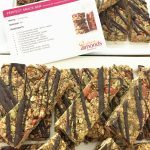 Those bars at IFBC were really good, I can’t wait to try your version! Hope to see you at IFBC next year. Thanks Lisa! Let me know if you try my bars or make your own version 🙂 I signed up for IFBC already — it was a terrific conference and I think it will be even better next year. Sacramento really put the welcome mat out for us.